Blog Expand your Circle of Trust in putting. Expand your Circle of Trust in putting. Everyone has their own personal circle of trust… that distance from the hole on a straight putt where you’re actually confident enough to bet on the outcome. What if the bet was $1000? When the chips are down, would it be four feet? Two feet? Or a puny six inches? When you miss a few short ones, because of inaccurate aim, your confidence will be shot. Next, you’ll start feeling a lot more pressure to roll your first putt really close to the hole. 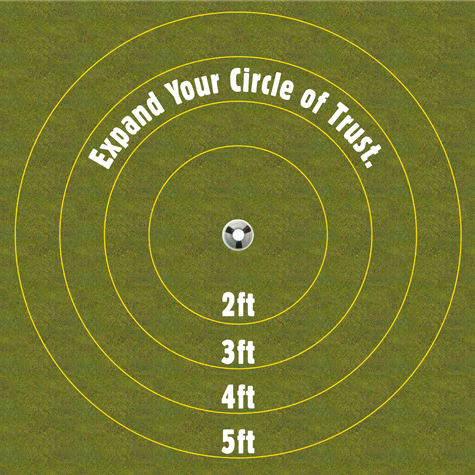 If your circle of trust is only 1 foot around, you’re going to hate those 40-footers, that’s for sure! After a couple three-putts, confidence with your putter goes out the window. And it gets worse. Next thing you know, you’re thinking about three-putting when you’re standing in the fairway, 100 yards out. “Oh man, I gotta hit this one tight. I don’t want to three putt again.” Start thinking like that and you’re bound to chunk it. The smaller the Circle of Trust, the bigger the problem gets. Thankfully, there’s a simple solution that does not involve endless hours of practice and a new, $370 Scotty Cameron putter. You really can expand your Circle of Trust by dialing in your aim and your equipment. When those two variables are eliminated, all that’s left is the stroke. And like I said, you don’t need a great stroke to make it consistently from three feet. We cover aim, alignment, equipment issues and even stroke basics in our hands-on putting workshops at GNL Golf. Bring your putter and we’ll show you how 8 out of 10 golfers are not aiming properly. Learn from Iron Archie, the most accurate putter in Florida. When you leave, your circle of trust will be measurably larger and your long putts will roll much closer. Wouldn’t that be something! Just snuggle it up there, tap it in, and move to the next hole with no stress, no strain. Meanwhile, your competitor is standing there sweating over a testy 4-footer. It will make the entire golfing experience much more enjoyable, all the way from the practice green to the 19th hole.